Want to earn great commissions while selling beauty products you love? Worried about taking a chance on a “new” brand or direct sales cosmetics company? LimeLight by Alcone offers you the brand recognition and quality that has made Alcone a household name for nearly 70 years. Become a Beauty Guide today and keep the tradition going! If looking your beautiful best and helping others achieve the same thing sounds exciting, then it’s time to step into the LimeLife! LimeLife by Alcone is a collection of gorgeous pro-level skincare,body care, cosmetic tools and yes, sensational professional cosmetics. Once you try them, you’ll love working with as an official company ambassador, known as a “beauty guide”. Founded by Alcone - a company that started out selling false eyelashes and high-end cosmetics to famous showgirls - that same attention to detail and premium product performance is tucked into every tube, palette and bottle. Becoming a LimeLife ambassador gives you the chance to tap into that timeless “showgirl” glamour while building your very own financially-rewarding business. Best of all, the range of colors, finishes and products found in the LimeLife collection allows users to make their looks as subtle or show-stopping as they want: the versatility practically sells itself. If you’d like to start or build on your entrepreneurial journey with a legacy-linked brand and professional-level beauty products, then LimeLife by Alcone is the opportunity you’ve been searching for. This direct sales cosmetic company even offers a 100% happiness guarantee on all of their products - that’s great news for you and your customers, because there’s no risk. If you’re ready to change your finances, your job satisfaction, your future and your look at the same time, pick up a premium brush, a favorite LimeLife palette and an application to become a LimeLife by Alcone Beauty Guide today! As a LimeLife by Alcone Beauty Guide, you’ll earn a 20% commission on the retail value of each product sale. 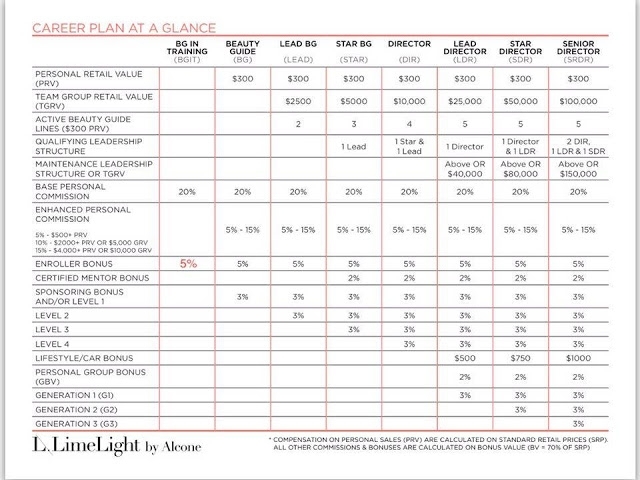 From there, you’ll be able to progress through 8 levels of sales volume, additional earning opportunities from team building and generational earnings, and even a car/lifestyle bonus for upper-tier earners! Much like other professional cosmetic manufacturers, LimeLife by Alcone knows that when you want to look phenomenal, one-size-fits-all approaches just won’t work! Their smart trio of $169 starter kits are specially assembled to work with your skin tone so that you can feel confident in what you’re demonstrating to your customers. The light, medium and dark kits all feature the same generous assortment of skin care products, a blending sponge, how-to guides and cards and marketing materials, but the cosmetics - lipstick, gloss, foundation, palette colors - are all customized to your skin tone. They know it’s easier to sell products that you personally use and believe in, and this approach gets your Beauty Guide career off to a great start! Several product lines for diversity: cosmetics, skincare, body care. Well-known brand name helps with recognition. “Limited Availability” items increase interest and desire. Starter kit customized to your skin tone for better demos. High-competition in the women's cosmetics market place. Some fees ($9.95/month for website, $75 annual membership) required. Popular products are occasionally on backorder. Starter kit does not contain samples to hand out, only full size items. Bottom Line: Quality products in a high-competition marketplace makes for a dedicated customer base. LimeLife by Alcone is one for people who love to look beautiful. This company is owned and operated by a truly professional and transparent group of women. We are constantly being trained and inspired. This company cares about our business as well as our personal growth. We have access to a complete site of useful information to help us each to be successful 24/7. The product it self is amazing, and the ingredients of which it is created sets it apart. This is a family owned company that has been in business for over 65 years, and has recently brought the LimeLight brand to everyday women to use and sell. Customer care, founders, and products are all fantastic! Professional grade makeup and the beauty guides care about their customers. What Is LimeLight by Alcone? LimeLight by Alcone is a direct sales cosmetics company founded by the famous cosmetic brand Alcone. The company sells a wide variety of premium and professional-level cosmetics, skin care, body care and cosmetic tools. How Much are Products from LimeLight by Alcone? Bodycare is priced between $26 for masks and $84 for specialty skin oils, with cosmetics falling between $12 for eyeshadow and $188 for their largest palette. Their tools range from $12 for vegan cosmetic brushes to $225 for a professional lighted makeup mirror. Where Can I Buy LimeLight by Alcone? Limelight by Alcone products are available through specially-trained and certified Beauty Guides, who sell through events, private sales parties or one-on-one through catalogs or branded online sales portals.